List of Jewelry in Spanish | Learn Spanish Language! Ornaments is what make our look better and we also called it jewelry. Many people love to wear jewelry specially women. It is very important to know about all jewelry name in Spanish because we are learning in Spanish. So we have to make our vocabulary strong. Vocabulary is very important because words make sentence and if we do not know about words which we want to use then we can not make sentence. As I have publish many vocabulary lists in previous post for you as- List of love words in Spanish, List of office objects in Spanish, List of Nationality in Spanish, List of time in Spanish. 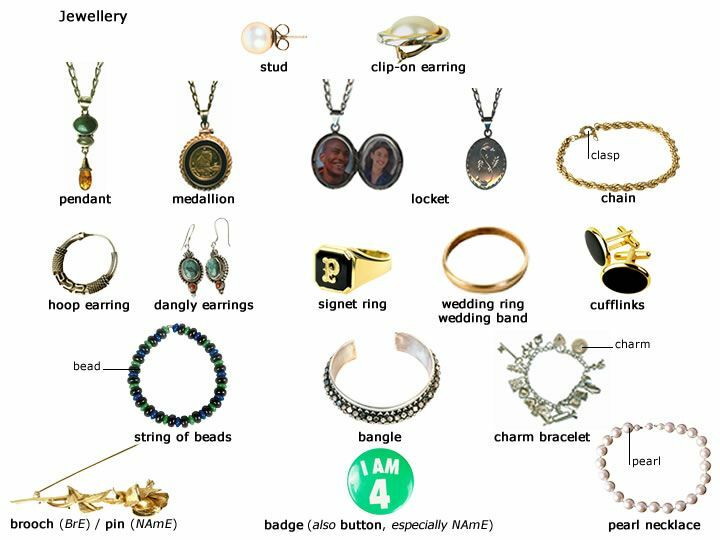 We have given lots of jewelry name in Spanish by which you can make your vocabulary of jewelry strong as I have told that vocabulary is very important to learn any language. So read given words related to jewelry and stones in Spanish and we have also given some sentence related to jewelry which will helps you to make sentences in Spanish. So these are almost all jewelry name in Spanish. So learn all list of jewelry names in Spanish. We have given some sentences related to jewelry. read given sentences and try to make your own sentences like this. If you have any problem then please comment in comment box. Her jewelry box was tiny and wooden. Su joyero era diminuto y de madera. I like to wear ring. Me gusta usar el anillo. Do you want to wear earrings? ¿Quieres usar aretes? Yes, I like earrings. Sí, me gustan los pendientes. Those pearl earrings look nice on you. Esos aretes de perla se te ven lindos. The princess was wearing an exquisite gold necklace. La princesa llevaba un collar de oro exquisito. Diamonds are a form of carbon. Los diamantes son un tipo de carbón. Marsha keeps pictures of her children as babies in her locket. Marsha tiene fotos de sus hijos cuando eran bebés en su relicario. This entry was posted in Basic Spanish for Beginners, Vocabulary of Spanish language and tagged Amulet in Spanish, Anklet in Spanish, Barrette in Spanish, Bracelet in Spanish, Brooch in Spanish, Buckle in Spanish, cameo in Spanish, Crown in Spanish, Diamond in Spanish, Earring in Spanish, Earring Jewelry in Spanish, Emerald in Spanish, Garnet in Spanish, Hairpin in Spanish, How do I say Amulet, How do I say anklet in Spanish, How do I say barrette in Spanish, How do I say Bracelet in Spanish, How do I say buckle in Spanish, How do I say crown in Spanish, How Do I say Diamond in Spanish, How do I say Earring in Spanish, How do I say jewelry in Spanish, How do I say locket in Spanish, How do I say Necklace in Spanish, How do I say pendant in Spanish, How do I say ring in Spanish, How do I say Ruby in Spanish, How do I say tie clip in Spanish, How do I say topaz in Spanish, How do I say Watch in Spanish, How do you earring in Spanish, How do you say Amulet in Spanish, How do you say anklet in Spanish, How do you say bracelet in spanish, How do you say buckle in Spanish, How do you say crown in Spanish, How do you say Diamond in Spanish, How do you say Jewelry in Spanish, How do you say locket in Spanish, How do you say Necklace in Spanish, how do you say pendant in Spanish, How do you say ring in Spanish, How do you say Ruby in Spanish, How do you say Topaz in Spanish, How do You say watch in Spanish, How do you tie clip in Spanish, How to say Amulet in Spanish, How to say anklet in Spanish, How to say barrette in Spanish, How to say bracelet in Spanish, How to say buckle in Spanish, How to say crown in Spanish, How to say Diamond in Spanish, How to say earring in Spanish, How to say jewelry in Spanish, How to say locket in Spanish, How to say Necklace in Spanish, How to say pedant in Spanish, How to say ring in Spanish, How to say Ruby in Spanish, How to say tie clip in Spanish, How to say topaz in Spanish, How to say watch in Spanish, Jet in Spanish, jewelry in Spanish, List of Jewelry in Spanish, Locket in Spanish, Medallion in Spanish, Necklace in Spanish, Opal in Spanish, Pendant in Spanish, Peridot on Spanish, Ring in Spanish, Ruby in Spanish, Sapphire in Spanish, Tie clip in Spanish, Topaz in Spanish, Using sentence related to Jewelry in Spanish, Vocabulary of Jewelry in Spanish, Vocabulary related to jewelry, Watch in Spanish on January 8, 2017 by satyenhacks.